YAMAGUCHI Ai paints lives of infant courtesans at “Toge no Ochaya*” that the artist created based on the manner in Edo period, on the unique canvas with thin and clear line, and hue. 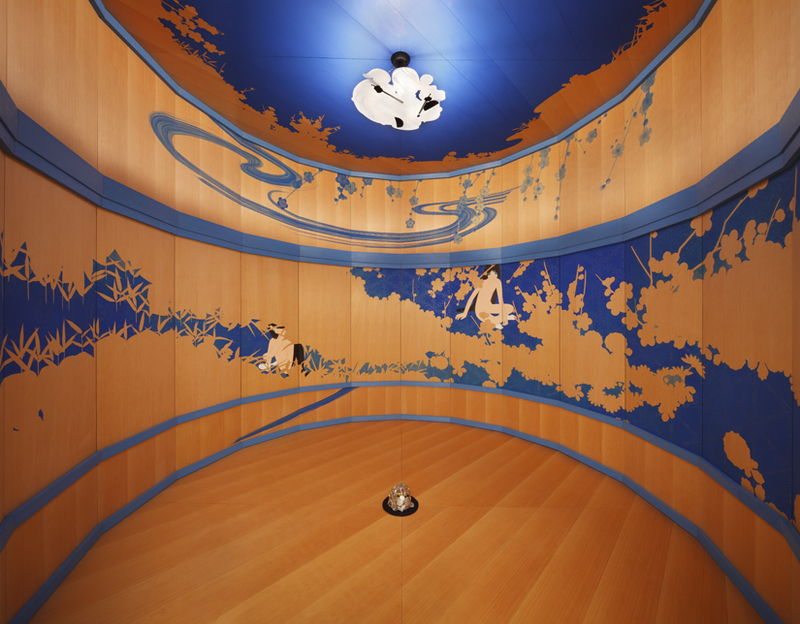 This exhibition is composed of the assembling-mural painting, “Hyaku no hana yuki wa furitsutsu” as the main piece, and the paintings on her original base made of a panel covered with blanket and cotton called “futon canvas”. She created the biggest and the smallest sized work ever. As this exhibition entitled “kiyu”, means “disappear” in Japanese, Yamagchi created works by capturing the images in a event of “disappearing.” Snow melts and disappears, flame burns out and water surface once existed around Iidabashi area where Mizuma Art Gallery currently locates. 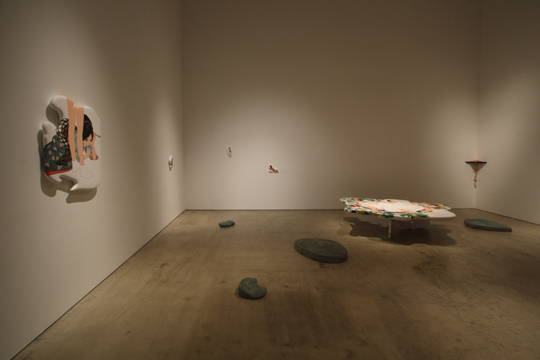 Yamaguchi paints the phenomena of “disappearing” and its reverse, “existence,” in her mind. The futon-canvas-works is in a form of smoke that comes from incense. It appears and disappears, it shapes and gone in the next instant. It overlaps with the fog in the spring, as well as the image of vapor that comes from sea surface looks like mirage. Capturing something fluctuating and unstable memorably emphasizes the vanished existence. Little girls were painted as something come and go in a smoke, however they are printed and implanted deeply in our mind. Existence and disappearance, plus and minus or positive and negative. Expressing opposite metaphors, she attempts to make us realize that there are lasting beauty deep in our hearts, not only on the work surface. And there is another hidden theme in the title “kiyu”, that is “yuki,” means snow in Japanese. Snow falls in the picture of the assembling-mural painting. 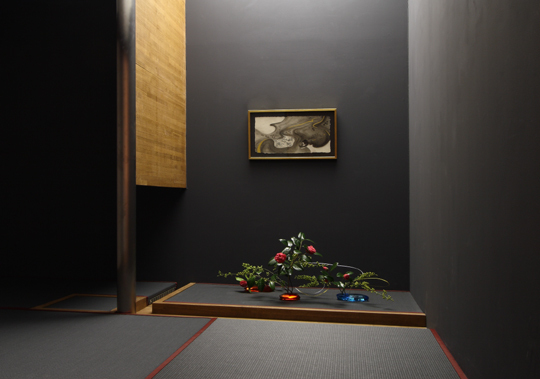 Yamaguchi uses the whole space to express tranquilness as if we are walking on the fallen snow. 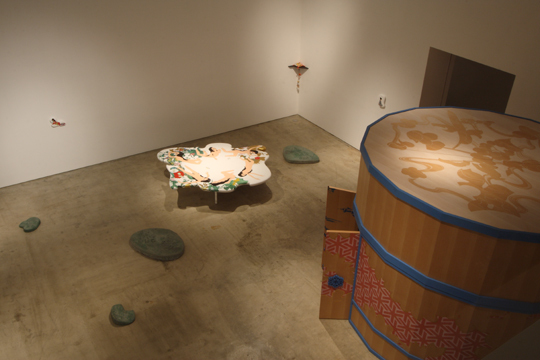 Yamaguchi’s works recall stories to the viewers. She translates the culture and custom cultivated in Japan, also the patterns and shapes generated from it with original sensibility to expand and create complexities in the work.